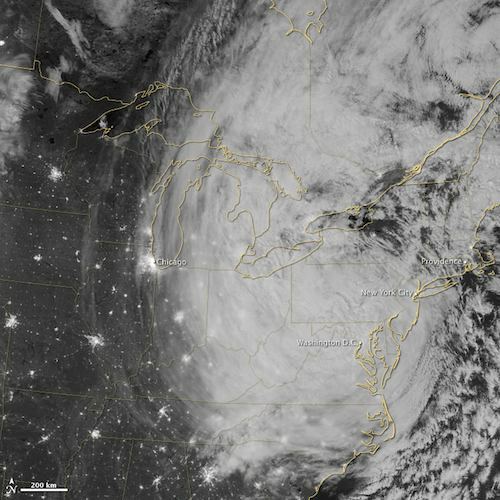 Even if you don’t live near the United States East Coast, you’ve undoubtedly heard and seen a thing or two about the wrath of massive storm Hurricane Sandy. It’s also not unlikely that you’ve already heard someone attribute the storm’s size and impact to climate change. According to Dr. Kevin Trenberth, one of the nation’s most respected climatologists, climate change is not the cause, but it certainly does have the ability to make these storms a heck of a lot nastier. In an interview with Slate’s Lisa Palmer, Trenberth notes that while there is a big chance element involved with hybrid storms like Sandy, hurricanes are still dependent on the environment. Changes such as warmer ocean temperatures, a moister atmosphere, and even rising sea levels all have the ability to intensify the impact of the storm. Higher sea temperatures mean that more moisture is feeding into the storm, which can increase rainfall by as much as 10 percent. Rising sea levels add to storm surges, especially when a storm makes landfall near high tide, which is exactly what happened during Sandy’s impact on the East Coast. Sea levels are currently rising about a foot a century. Over the last 20 years alone, sea level has risen by 2 ¼ inches. It doesn’t seem like much yet, but as you saw in the case of Sandy as it hit lower Manhattan, Atlantic City, and other places, it matters. The moral of the story is that climate change alone probably won’t cause any storm that didn’t exist in the first place, but if you’re starting to notice a trend in the intensity, it’s likely that sea levels, temperatures, and other factors are already adding some serious fuel to the fire. Even more reason why we cannot afford to waste any time when it comes to cleaning up our energy act.